If you are looking for an activity for date night or to do with the entire family but have exhausted the normal options, here is a great list for you today! Its time to hit the astro turf and track your score while playing miniature golf. This sport is known by other names such as putt putt golf or mini golf but it usually consists of small putting irons, colored balls, plastic grass, tiny holes and obstacles and odds stacked up against you. Most locals in the Omaha metro area have visited or at least driven past this big time summer business. Mostly known for water slides, a lazy river, wave pool and go carts, this bustling place also offers 18 holes of miniature golf. Gameplay is included in the cost of admission which is $16.95-$24.95 per person depending on your age. Normal hours are 11am-8pm. That price grants you access to all of the attractions of the park. Or if you visit between 4pm-8pm you will only pay $12.95-$16.95 per person. 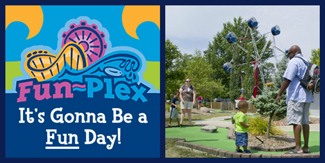 Fun Plex's rides season will end August 14th, 2015. 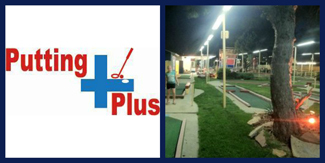 Another option for testing your talents is Putting Plus. The business specializes in one thing and they have been in business since 1967. They are open from 10am-11pm on most days of the week and have 3 different courses with 18 holes each. Prices range from $6.50-$3 per person depending on your age but they do run daily specials on Mondays, Thursdays and Saturdays. Their putting season ends on October 15, 2015. 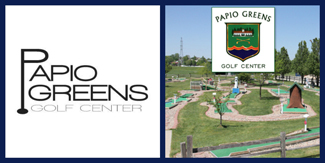 Finally, Papio Greens Golf Center offers two challenging 18 hole courses. 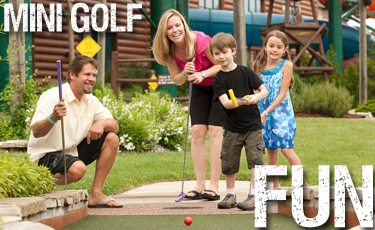 Avoid obstacles to your heart's content with their unlimited golf rate of $7 for adults or $5 per child. Council Bluffs is lucky to be so close to Omaha's great entertainment offerings.